French President Emmanuel Macron (L) shakes hands with a firefighter during a visit in the streets of Paris on Dec. 2, 2018, a day after clashes during a protest of Yellow vests against rising oil prices and living costs. 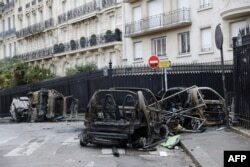 Burned cars sit in a street of Paris, Dec. 2, 2018, a day after clashes during a protest of yellow vests (gilets jaunes) against rising oil prices and living costs. 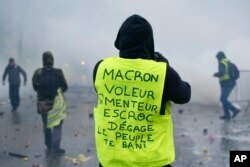 "[Violence] has nothing to do with the peaceful expression of a legitimate anger'' and "no cause justifies" attacks on police or pillaging stores and burning buildings, Macron said.